Taproot Commons Farm (formally Warner Farm) is a 131-acre privately-owned property in Cummington, Massachusetts, permanently protected in 2010 with a Conservation Restriction jointly held by Hilltown Land Trust and the MA Department of Conservation and Recreation. This private landowner’s property was conserved to continue the legacy of farming (it has been farmed since the 18th century) and to protect surface water and wildlife habitat. 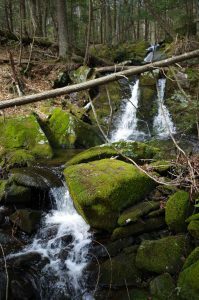 There are two streams on the property, Porter Brook and Tower Brook, that flow from wetlands. 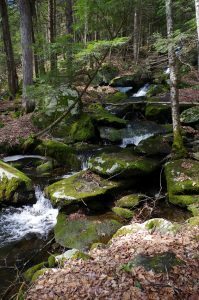 The property includes a short, public trail that extends approximately half a mile from Porter Hill Road to an attractive waterfall on Tower Brook. The land remains in private ownership, but the landowners allow the public to hike the trail. Please respect the property and stay on the trails. This property is an active farm, please be aware that there may be some sugaring lines in the trail during maple sugaring season. The trailhead is on Porter Hill Road in Cummington, Massachusetts. Coming from Northampton, take Route 9 through Williamsburg and Goshen and continue to Cummington. Take a left onto Fairgrounds Road and follow for about a mile. Then take a right at the fork onto Porter Hill Road. Follow this road for .2 miles and the parking area will be on your left. Coming from Pittsfield, take Route 8 and Route 8A through Dalton and turn left on Route 9. Follow route 9 through Windsor to Cummington. Take a right onto Fairgrounds Road and follow for about a mile. Then take a right at the fork onto Porter Hill Road. Follow this road for .2 miles and the parking area will be on your left. Coming from Westfield, take Route 112 toward Worthington. Take a right onto Ireland Street in South Worthington. Follow this road for five miles until you reach route 143. At the intersection with Route 143, continue straight onto Fairgrounds Road. Take a left onto Porter Hill Road after four miles. Follow this road for .2 miles and the parking area will be on your left.